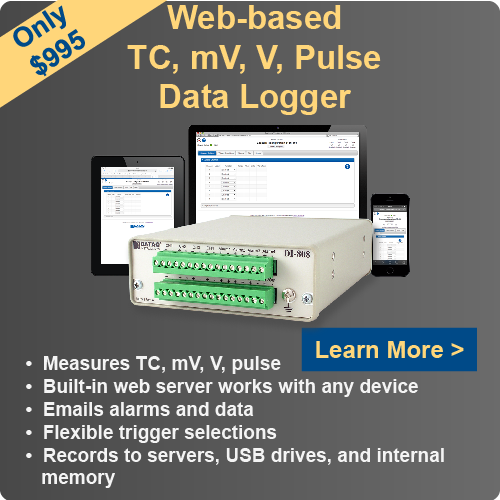 « DI-159 PLC Now Available! Frustrated because you can’t sample as slowly as you’d like? Assuming that you want to acquire data any slower than a sample every 9 or 10 minutes, you’re likely bumping up against the minimum sample rate limit in WinDaq. To follow up on a recent blog post concerning slow sample rates, here are a couple of tricks that allow you to sample even slower. Reducing the Maximum Sample Rate (Edit>>Preferences>>Maximum Sample Rate) in WinDaq allows you to enter a slower throughput sample rate (Edit>>Sample Rate). The minimum rate that you can enter here depends on the instruments that you’re using. Entering a value that is too low will result in a dialog box, indicating maximum and minimum values. As mentioned in the previous blog post on slow sample rates, the sample rate that you enter in WinDaq (Edit>>Sample Rate) is divided by the number of channels enabled. Consequently, enabling more channels reduces your per channel sample rate. For instance, say you’d like to sample a single channel once every 25 minutes or so (0.00083 Hz). With one channel enabled and the maximum sample rate reduced, WinDaq tells you that the throughput rate must be at least 0.0019 Hz (one sample every 8.7 minutes). By enabling two “dummy” channels (3 channels, total), you’re per channel sample rate is reduced to 0.00063 Hz or a sample every 26.3 minutes! Once acquisition is complete, you can simply disregard the “dummy” channels. © 2018 DATAQ Instruments, Inc.